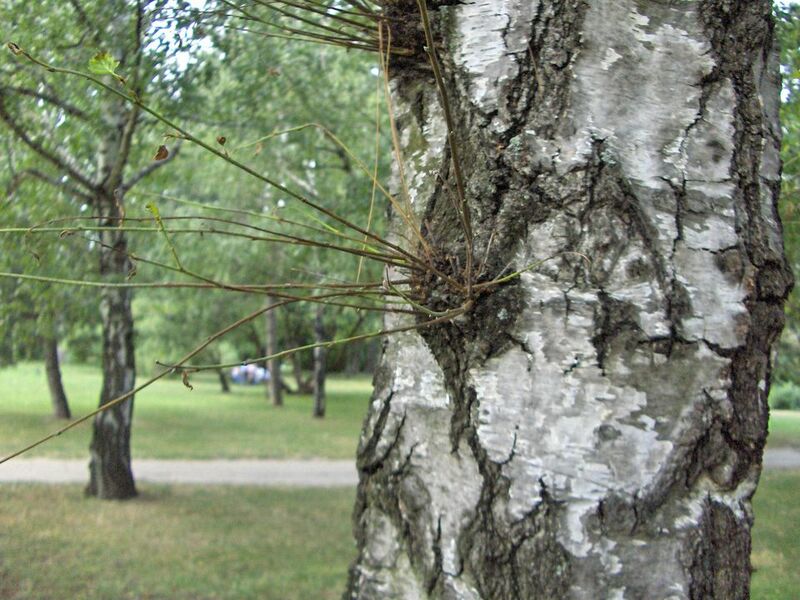 When a landscape tree or large shrub begins to send out strange, out-of-character growth shoots from the trunk or from older established limbs, you are likely dealing with a growth phenomenon known as watersprouts. They tend to grow with uncanny speed, sometimes in clusters from a single point. Most homeowners have an instinctive wish to prune away these strange, disfiguring growths, which is precisely the right impulse to follow. In practical terms, watersprouts can be considered the above-ground version of the suckering shoots that sometimes pop up around the base of trees and shrubs. And like those in-ground suckers, watersprouts should be pruned away—unless you want to try your hand as using them in grafting. Watersprouts are the growth shoots originating from growth nodes either on the surface or buried in the old wood of a plant. The new growth is very thin relative to the parent branch and the joint between the sprout and branch is quite weak. Like a sucker, the watersprout wood is juvenile and fast-growing, fed on the water and nutrients provided by the established parent wood. Though they happen naturally, and rather frequently in some species, watersprouts are generally regarded as something gone wrong. Waterstprouts originate from old buds often invisible buried in the old wood. In nature, suckers and watershoots perhaps offer a means by which a badly damaged plant can survive, but in landscape use, watersprouts are considered a waste of energy that diverts growth from the main plant. Because watersprouts are tender, young growth shoots, some people believe them to be a vulnerable access point for pathogen attacks. In a commercial orchard, watersprouts are an unwelcome nuisance, since they break the good architecture of the tree with weak wood that doesn't bear any fruit. In a residential landscape, watersprouts disfigure the classic look and shape of a tree or shrub. For the most part, watersprouts don't cause harm but are an aesthetic problem. We usually remove them just because they seem ugly and out of place. Thin growth, especially clusters of thin growth, that originate from spots where there does not seem to be a node or bud are known as suckers. Suckers generally don’t occur on younger wood, where the buds are at the surface and under control of hormones dictating healthy growing patterns. The term sucker is usually reserved for the type of shoots that grow up through the ground from roots. When these new shoots erupt from older above-ground wood—the trunk or older branches—they are known as watersprouts. Watersprouts, like suckers, often bolt for the sun. When protruding from the top of a branch, they are strangely upright, fast-lengthening stems that break the architecture of a good scaffold branch. When they come from the trunk or a vertical branch, they will sometimes curl upright rather than stretch out. A heading cut on a large branch, where a short stump is left remaining rather than cutting it flush to the trunk, is almost guaranteed to produce watersprouts near its tip. Cutting a major branch back to its base may still cause some sprouting around the wound. Excessive pruning that exceeds the 1/3 rule (pruning away more than one-third of a plant's branches) makes watersprouts more likely. Major die-back, of any kind, such as the type created by extended drought or winter kill, can cause a plant to erupt with watersprouts. A wound to the trunk may cause sprouting around the wound. For example, a boulevard tree struck by a car may soon develop waterspouts near the torn bark. Most of the time, you’ll be removing watersprouts as waste wood. There is no skill to it; just cut them off any convenient way. For first-year sprouts, it is not important to make a clean cut at the base because the wounds from removing these are minor and will heal quickly. If you catch the shoots very early, you can even rub them off with a thumb. They are weak and easily detach. Sprouts that have hardened (older than a year) do need to be trimmed at the base off with the cutting tools appropriate for their thicknesses—pruners, lopping shears, or saw. When the watersprouts are high in the tree, this can be a difficult task best left to professionals. While they are a detriment to mature, established plants where you want fast growth to occur only at the tips, watersprouts provide the shoots to use as scions in grafting procedures. By using watersprouts, it is possible to get young cuttings from a tree without going high into the crown. One-year-old wood is typically the ideal material for scions. The wood found suckers and watersprouts is juvenile wood and is thus fast-healing and fast-growing. It is also thin and flexible, ideal for many types of grafts.